This is a minor version update, but it’s actually just putting a missing feature back in: The pen width test function is back. Pretty dull huh! 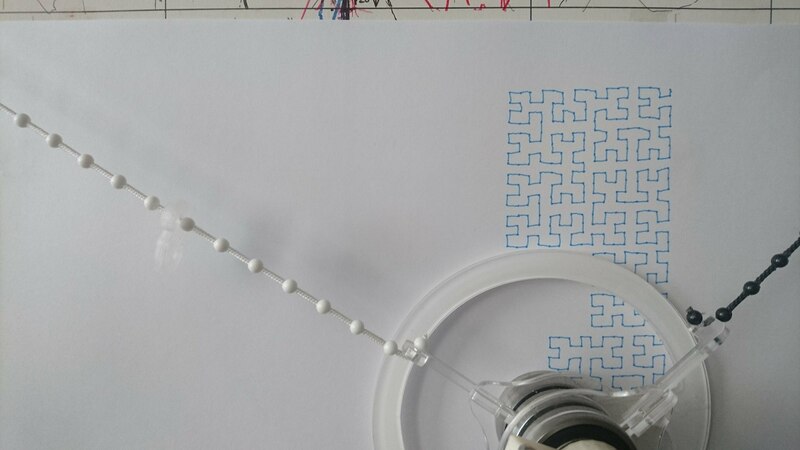 The PolargraphSD’s pen gondola has a servo motor attached that turns a control horn against the paper, and lifts (or drops) the pen tip against the page. 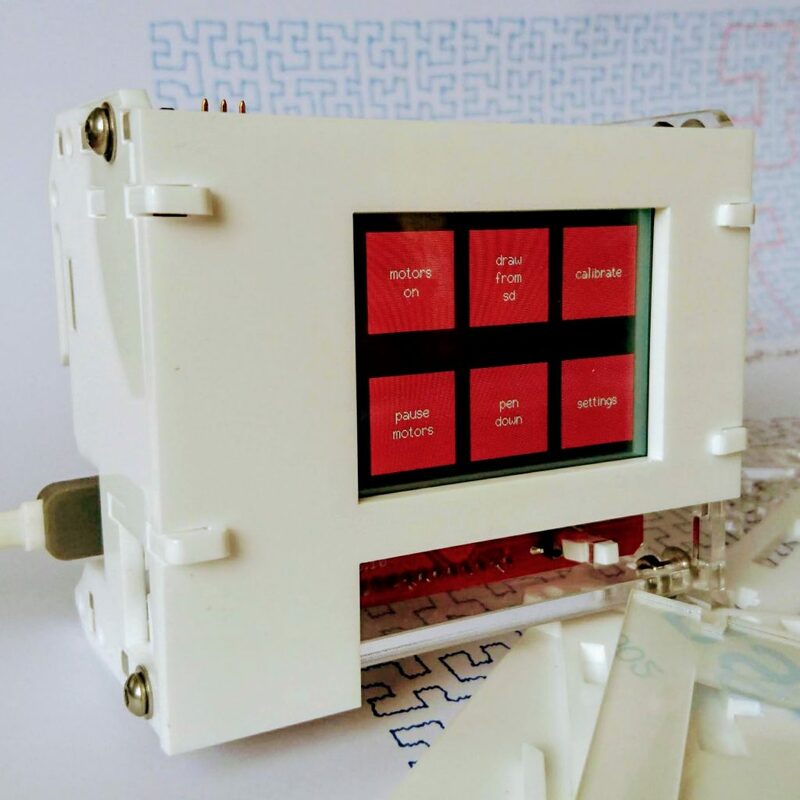 In the new design, the servo is powered by a 5v supply, but the instructions (the signal to say which position to move to) comes from the ESP32, which is a 3.3v device, and so it’s signals are 3.3v. It turns out this was a bad idea and it causes a lot of twitchy moves. For two dozen machines, it’s not been a problem that concerned me – indeed I didn’t even find it to be a problem, which is why I didn’t do anything about it. In retrospect, the mixed voltages seems obviously risky. I recall that it was an open question when I was first designing the new Polarshield 3. Because the old machine was 5v-based, the initial design for the new Polarshield used the same scheme to power the motor. I remember being a bit surprised that it worked fine! I don’t think I even tested it on the 3.3v supply. However, this week I built a couple of machines in a row that were unacceptably twitchy, and couldn’t ignore it because I knew it’d cause problems for people, and be very hard to work around “in the field”. 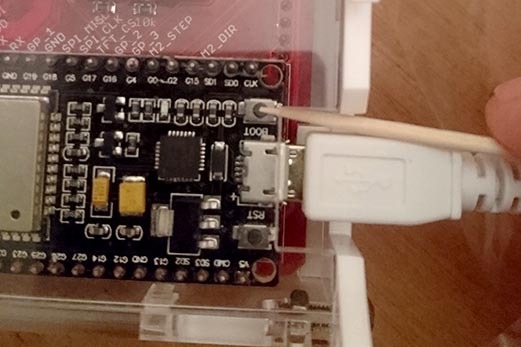 The fix for this is pretty simple – cut the 5v line to the servo and link in the 3.3v line instead, but it’s a soldering job, not something I could expect anyone to do themselves. And after that, what a smooth arc! Another side-effect is that the machine can now sweep the servo when it’s only powered by USB. Previously that would draw too much power and cause a reset! Nice! The machines that I’ve already sent out since the beginning of September may exhibit this problem and need a fix. I’m really sorry that I didn’t spot this earlier. I’d be delighted to do the repair if you’d like to send your control box back to me! If you’d like the fix, please drop me an email and I’ll arrange a collection as quickly as I can. 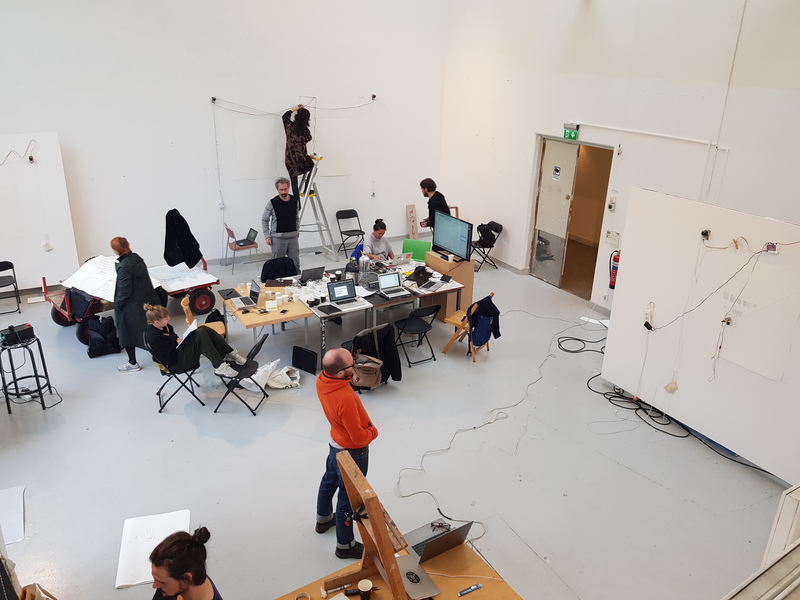 Patrick Wagner designed, organised and ran a workshop at the Royal Institute of Art Stockholm, using Polargraph machines to create beautiful marks on flat surfaces. Two brand new PolargraphSD v3.0 machines joined their lineup, and it was co-hosted by Christian Bazant-Hegemark. You’ll know Chris from the Polargraph forum and also from his documentary series On Doubt. Patrick is a printmaker and has ran workshops with the Polargraph at the Royal Institute of Art Stockholm a couple of times already, but this was the most focussed so far. They are both creative visual artists in their own right. 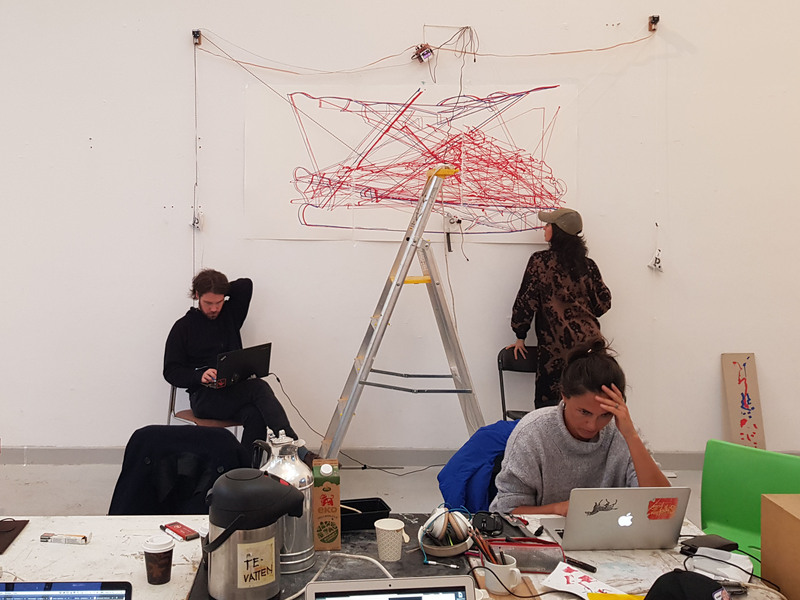 This was a session for an international crowd of people who are practicing artists or also educators in the fine art field, to learn about what a drawing machine could bring to their process, and they had a great time making some wonderful marks. I was so pleased and excited to see the pictures coming out of that week long session, and glad to see that two fresh PolargraphSD v3.0s worked great, alongside a cast of existing machines. Seeing what happens when the tool is recognised for what it is, and put into the hands of people who value the act and the process as well as the outcome is absolutely thrilling! Discussing the workshop with Chris and Patrick was also seriously enlightening, it collapsed a lot of waves and really clarifies my thinking. When I don’t talk to people much, my mind runs away into little cul-de-sacs where I’m making decisions without much information. I used to be the customer myself, after all, I built the machine for myself to do my own work as part of my own process. 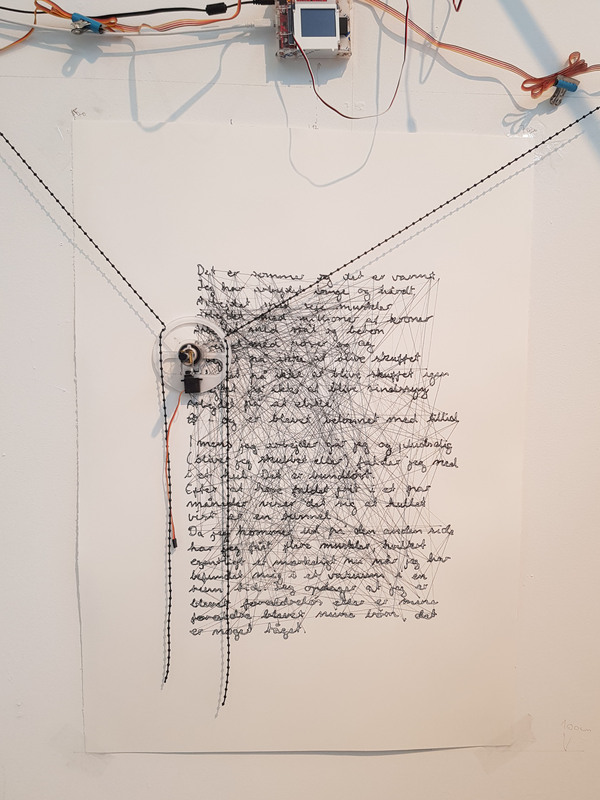 Now however, I don’t use the machine much for creative work, and so I’m easily disconnected from “the user”. Workshops like this, along with the advocacy from experts like Patrick and Chris are so useful. I had ideas for a bunch of features that I’m not going to take further, and learned ideas for a bunch I will. Unglamorous stuff like “longer power cables” or “a pause button that works”. 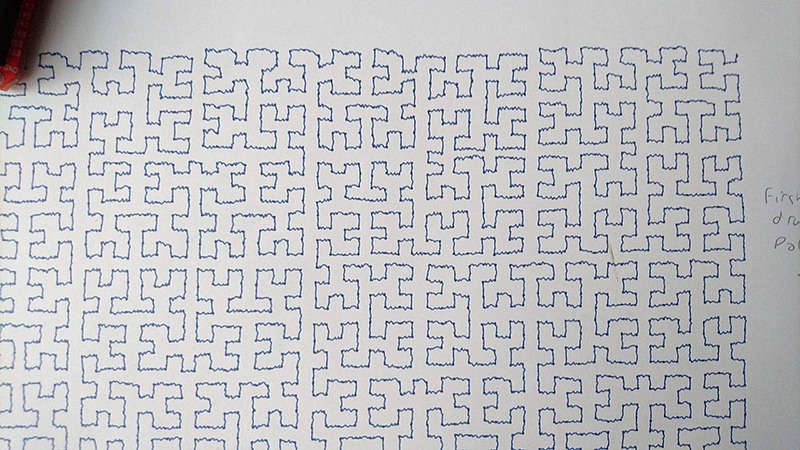 One of the things that often introduces a tension into my thought is imagining that buyers just want a plotter, or just want something quick, or just want something easy to understand. It’s easy to get into that thought pattern, but it does you all a disservice, and it runs quite counter to the ethos of the Polargraph. 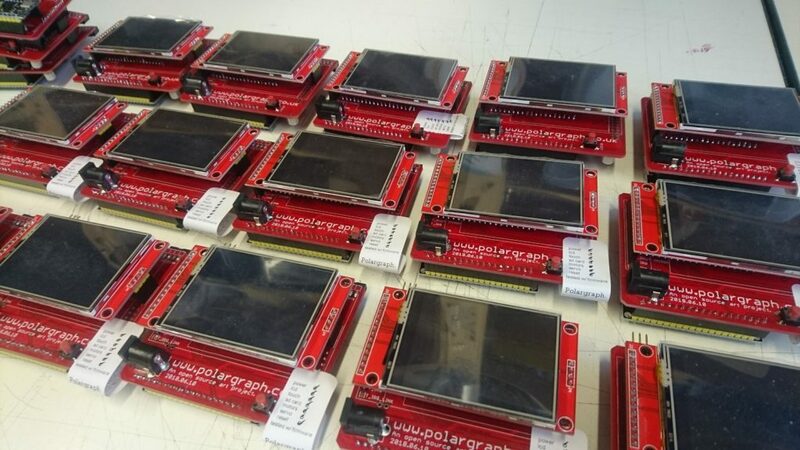 It’s a luxury to have an principled stance in commerce, but I think that’s really one of the things that makes Polargraph different to other kits. 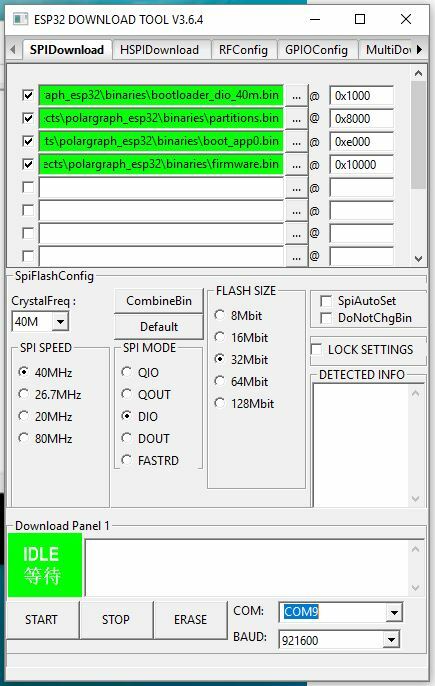 I’m simply not that interested in Polargraph being a general-purpose, high volume, fast and perfect machine that does repeatable, sharp, registered editions. It’s never going to be that. It is simply the wrong process if that’s your goal. “… these artists are OK with a process taking time, with fine-tuning sometimes going wrong, with stuff not working right away. While it can be frustrating as well, artists also often benefit from such mistakes (a pen drying up during an overnight print; a badly-positioned gondola resulting in the drawing not being perfect on the paper, etc). 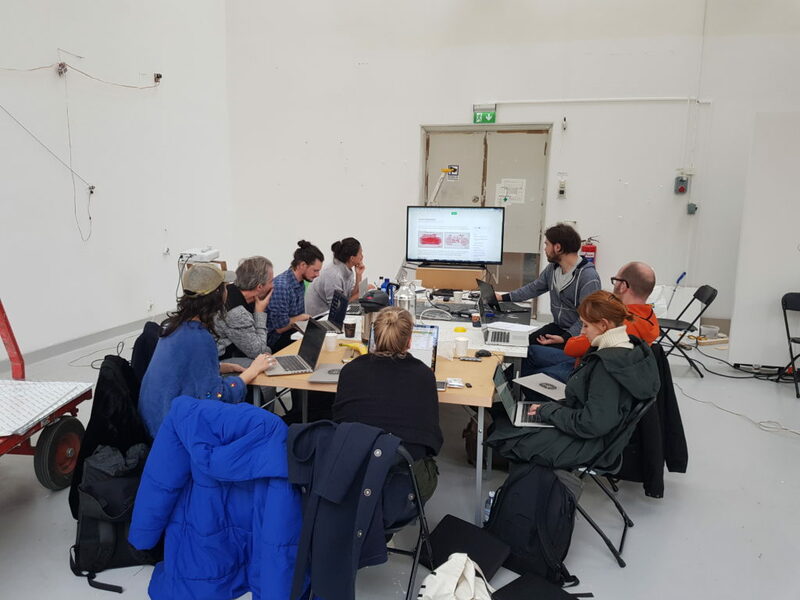 Getting news of this workshop was such a terrific validation and a glorious piece of news that really helped my bring my full enthusiasm to the launch of the new PolargraphSD v3, which I’m finally getting some reliable stock on (see here for that: https://polargraph.bigcartel.com/product/polargraphsd-v3-0-full-assembled-kit). Thank you very much to Patrick and Chris for running such a good event, and thank you extra very much for the folks who attended and helped inspire me to keep building the Polargraph. I posted a note out to the mailing list (http://eepurl.com/dhVafP to add yourself) announcing that the first eleven machines were in stock (https://polargraph.bigcartel.com/), and within two hours they had all been claimed! I was amazed and encouraged and excited, because I was rather expecting that most of you would have given up waiting after getting almost a year’s-worth of “maybe next month” from me… So I’ve got a few left of that first batch still to pack up and post out, and then I need a bit of a pause to wait for some more lasercut parts to come in (congratulations to my lasercutting lady for her new baby – I can’t really complain too much about that delay!). I got a big shipment of power supplies earlier this week and have half a dozen machines-worth of parts absolutely ready to go, bar acrylic cases. I’ll list those as soon as I can, and send a note out on the mailing list to those who have ticked the “tell me when you have stock” box. Subscribe to the mailing list to be notified. If you’ve missed out this time around, please be patient. I feel very confident in this new design. The machines are shipping with firmware v2.0.1 onboard. This is more-or-less feature complete, matching what the old MEGA-based PolargraphSD could do. The main thing missing is the Norwegian Pixel style. I’ve since worked up firmware v2.1.0 which reinstates the Norwegian Pixel style and also adds menus and buttons to the onboard touch interface to change machine size directly. It can also change the page size and position. This doesn’t really do anything yet, but I’m going to put a bit more thought into how the machine gets used in practice, hopefully helped by my beta testers Patrick (Wagner – Blackheart Press) and Chris (Bazant-Hegemark http://www.bazant-hegemark.com/) who will be testing this out in a workshop for The Royal Institute of Art Stockholm soon. Since starting shipping I’ve already discovered an irritating issue where a 160 second pause randomly appears while drawing. It seems to be limited to USB traffic (I mean it doesn’t happen when drawing from SD card), and it doesn’t actually crash, it just stops to think for a couple of minutes. I’m sure this is a timer overflow or something like that, but these microcontrollers are hard to debug. That’s my number 1 priority because It Is A Stinker. I got some nice lasercut parts through today from nice-cuts. Nice cuts! The case looks pretty good. I added 0.1mm to all the slots for tabs to go into. It does make for a slightly looser fit, but overall I’d rather a loose fit than a tight fit that will lead to cracking. This is the second iteration of the case, and has a few extra hooks and holes to give mounting options. It’s getting quite close! Very exciting! One of the challenging and exciting parts about Polargraph is trying to avoid changing things while still progressing the project. 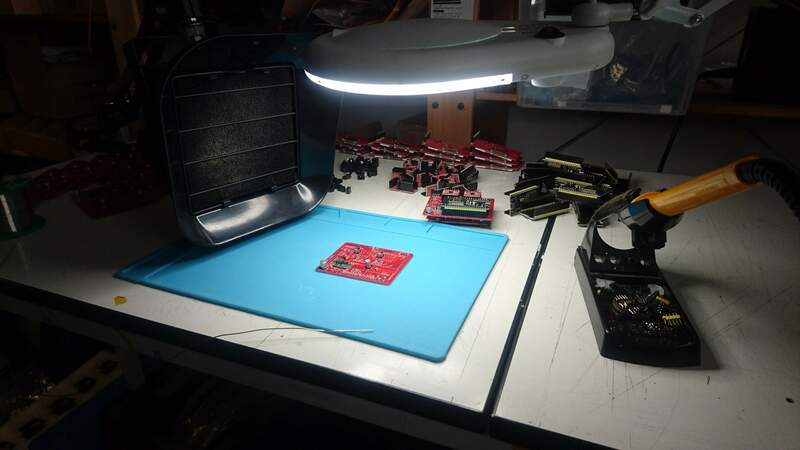 Changing things is easy enough when it comes to code (though requires re-testing), but it gets harder and more expensive (and much slower) when it’s a physical item, like the PCB or the case. The last case was lasercut acrylic. 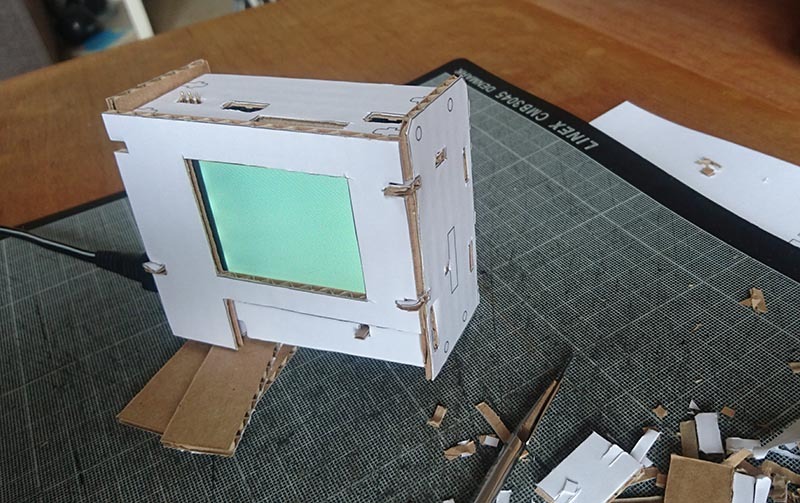 This new one will be too, but I don’t have a laser cutter nearby, so I prototype in cardboard. This is just the shapes printed out and stuck to the a sheet of corrugated cardboard, and cut out with a scalpel. There’s limits to what degree of realism I can achieve with this low-fidelity mockup, but I can test the major interactions. I discovered I’d completely forgotten to put a set of tabs in on the end plates. Other than that, a bit of misalignment here and there. The files are off to the laser cutter! In other news, I have had some good results with the new firmware (https://github.com/euphy/polargraph_server_polarshield_esp32) which has got high stepping rates, along with good responsiveness from the screen. Happy with it so far… But I haven’t tested it properly yet! Eeek! 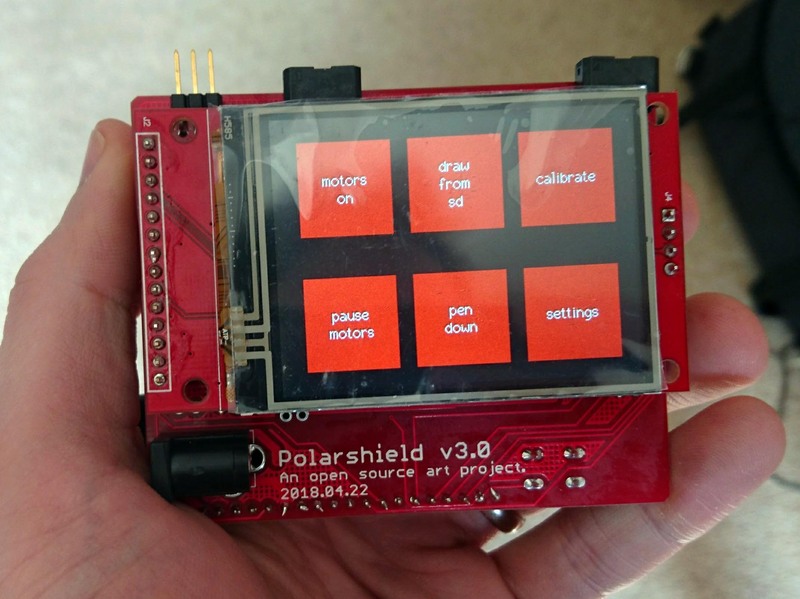 The new Polarshield v3.0 is a refreshed version of the core Polargraph hardware. It has been re-designed from scratch and snips out a few of the snaggles that the old machine had. So the only real difference is the controller, which is a fast, 32-bit, dual-core device, with a real-time operating system (RTOS), oodles of memory AND built in bluetooth and wifi features. There is a working Arduino-based toolchain for this ESP-32 device, but it also has the horsepower and memory to run micropython. I’ve ported the standard polargraph_server_polarshield code to target this platform (in a branch – https://github.com/euphy/polargraph_server_polarshield/tree/esp32) and it works great … in principle. There’s a couple of bits don’t work yet, and I haven’t done any long drawings with it. 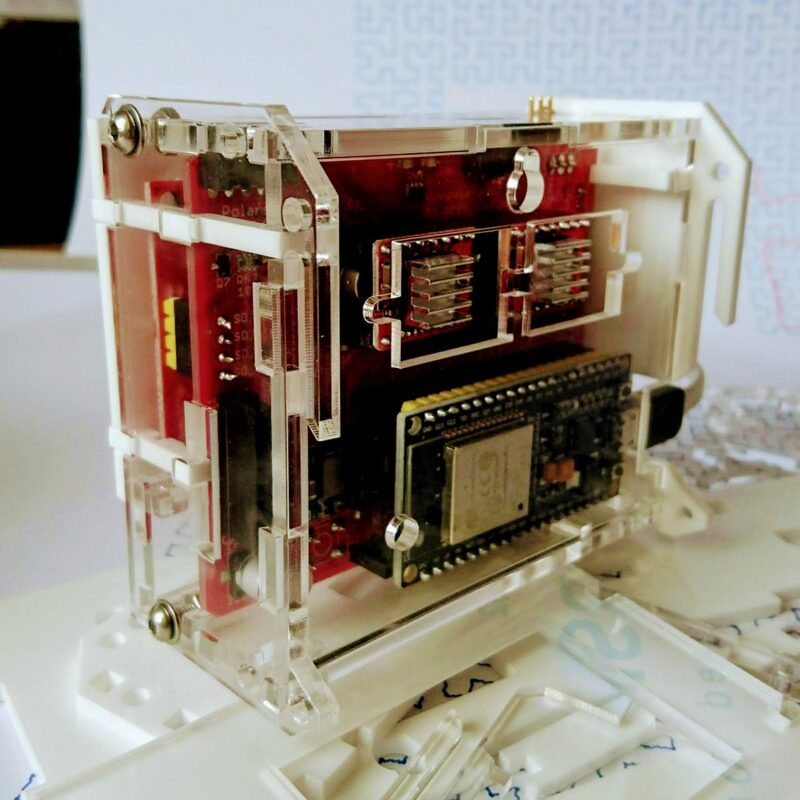 On the Polarshield itself, the hardware design is simplified because the ESP-32 is a 3.3v device and so are the stepper drivers, touchscreen and SD card, so there’s no need for level shifting. The LCDs are of a more modern and widely supported design too, so I expect to have fewer problems with them. I haven’t yet implemented any features around the encoders, endstops, wifi or bluetooth, and might never do that. The Polarshield v2 has never been a reliable build. 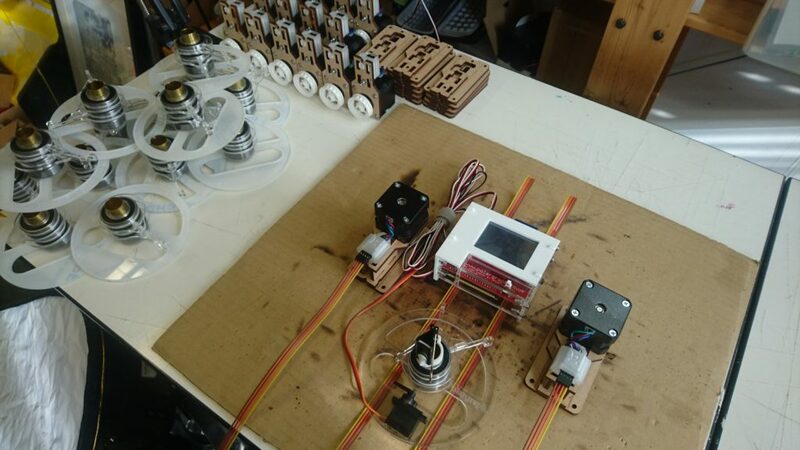 The straw that broke the camel’s back was earlier this year when I was building a batch and I ordered 20 boards, built them and only got six working Polargraph machines out of them. The LCD that it uses is growing to be somewhat esoteric in that configuration, and so it’s hard to debug. It uses a kind of simulated SPI which just isn’t reliable enough, or has too many odd interactions with other parts of the circuit. The new 5v step-down power supply is an economic choice. I’m using a little off-the-shelf mini-assembly with a MP2307 and an inductor on it, rather than building the supply right onto the board itself. Amazingly, the little assembly is available to buy (ready-made) for less money than it costs me to buy a single MP2307 chip on it’s own. The ESP-32 is a little cheaper than a good Arduino Mega-2560 clone. The current Arduino toolchain is a bit of a dog to set up, but dedicated developers has done an amazing job porting libraries to it. It’s dead fast and has a good small footprint. Mega-2560s are huge. Natively running at 3.3v is a bonus and performance with SPI-based touchscreens is phenomenal. 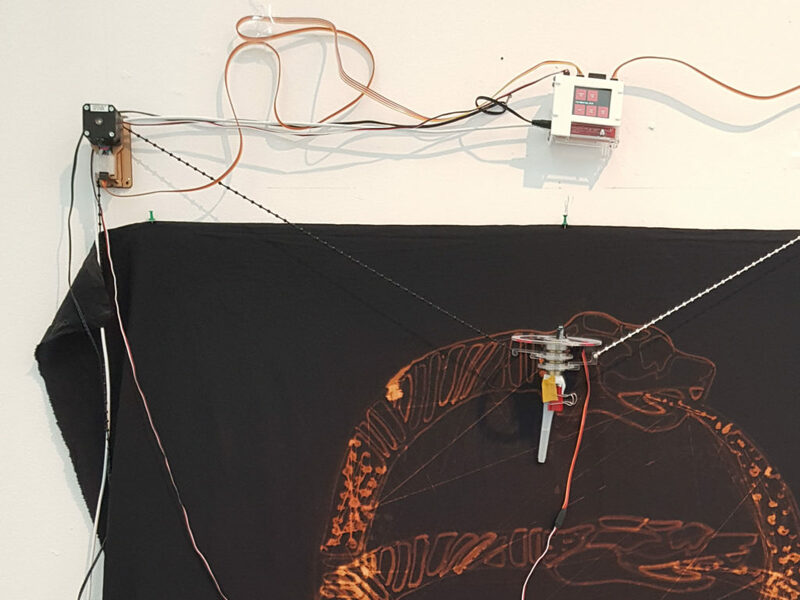 This is a platform that could easily take us into PolargraphPro territory, with encoders and endstops to make for a safe and reliable continuous drawing experience. The MCU is powerful and the wireless features are very tempting. However, I have no immediate plans to implement any new features and will focus on getting old ones ported and re-worked where necessary. I’ll probably take this opportunity to dump a few lesser-used features too.